Running a bit late with this issues spoiler-free one panel teaser, but how many times have your friends told you the person who you feel you are theoretically perfect for is a blood thirsty, sadistic harpie? Well, never needing anyone to do his detective work for him, the Martian Manhunter figures this out for himself in Brightest Day 12 - and boy does the big green dude get ticked. 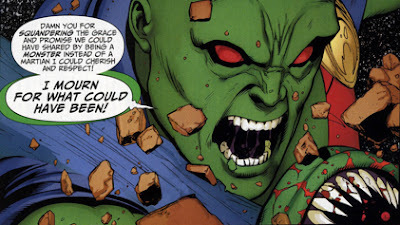 While the issue also flips us a clue as to who is ordering around the new Black Lanterns, while giving us John vs. the Justice League and killer, killer art, I loved this panel simply because it highlights the moral centre of J'onn J'onzz - getting infuriated over the loss of what could have been. 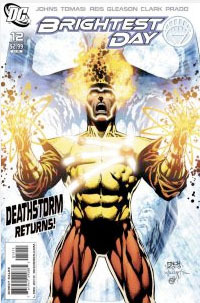 For the could've-been-lovers spat in full, grab your copy of Brightest Day #12. In a way he speaks for all of us! Yip, I think so too Arron! J'onn is just one guy you never want to see angry. I'm still miffed that my comics didn't come on Saturday, so I'm out of the loop. Hopefully they'll be here Monday so I know what's going on! Somehow I don't think this first date will be their last date! I'm curious to see if DC is going to terraform Mars and set up a new series around that. I really hope DC doesn't go with the terraforming Mars angle. I really, really think that's the wrong angle for J'onn. He needs to be back amongst humans in Middletown solving crimes. Otherwise he's just a Superman clone. I agree Liss - I still think the Martian/detective angle is awesome and still has plenty of road to run yet. Still it is great that folks are talking and guessing about the future of the Martian Manhunter again or how long? Hope your comics have arrived! And you are right ToB - somehow I think this date is going to be one of those nightmare ones that keeps reoccuring!